The first major cover change in 25 years -- the famous blue book turns BROWN! 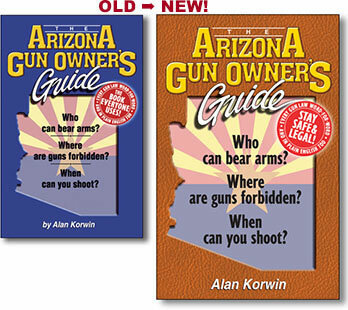 Every change to Arizona gun laws since 1989 is included in one easy guide. Summaries of the changes back through 1996 can be found linked below. additional preemption protection, drinking for armed retired police, more. Print it all on one sheet of paper to insert in your book. (how the feds snuck through a ban despite the obvious statutes). of innocent individuals in the false name of stopping crime. The 25th edition remains the most current edition in print. These changes to Edition 25 take effect August 2, 2012.
fit into your book. To read the update online click here. These changes take effect on July 20, 2011. Our official state firearm is the Colt Single-Action Army Revolver. These changes went into effect on 7/29/10. Additional statutes and conditions will be posted soon. Record-keeping ban, hunting and fishing ballot measure, more. Statewide preemption is strengthened, preventing localities from infringing RKBA. Firearms Freedom Act: Arizona joins national movement to control Congress. Get 2007, 2008 and 2009 as a printable insert for your book. arbitrary "dangerous offense" an optional charge prosecutors can use as a plea-bargaining tool; more. it does not and should not have.